Creative Jumpstart got me going again with mono printing and using the few Silks Acrylic Glazes from Luminarte's Dreaming Color and Luminarte's Twinkling H20s that I have. 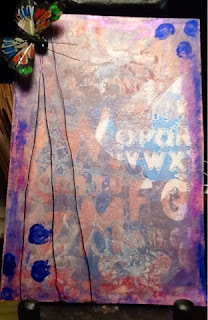 I used stencils, brayer, brush, stamps and a glue stick lid to make interesting layers on the board. I also added the Silks (Rich Cobalt) and LuminArte's Passion Fruit and Rose Gold to edge the board. A deep purple wire and colorful butterfly were the finishing touches to the canvas. I love the depth that I got with this mono print.